He's making his list and checking twice, he's going to find out who is naughty or nice…Santa Claus is coming to Uptown! 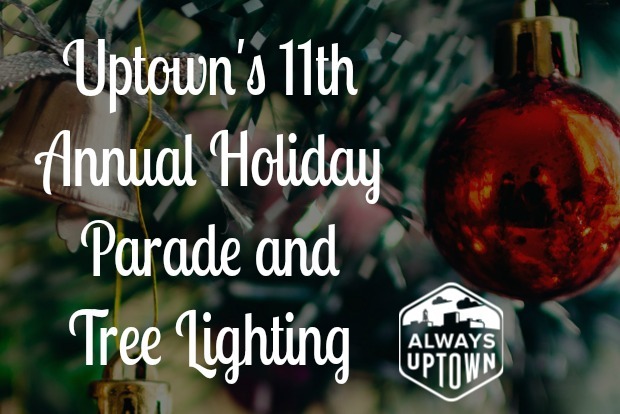 Uptown Columbus, Business Improvement District, Columbus State University Servant Leaders, and Uptown Merchants host the 11th Annual Broadway Holiday Festival on Friday, December 7, 2018 from 6:30-8:30 PM on the 1100 block of Broadway. The best part? It's free! Christmas lovers rejoice as Santa is escorted in by his entourage! Sing along to traditional Christmas carols at the lighting of the giant Christmas tree! There will be hot chocolate, candy canes and lots of fun for the entire family. Participants are encouraged to wear their favorite holiday attire and to bring their camera to partake in the many photo opportunities! For the fourth year, Columbus State University's Servant Leaders have partnered with Uptown Columbus on the Uptown Tree Trail, a trail of ornately decorated trees in the median of Broadway to shine all holiday season! For more information, please visit UptownColumbusGA.com or call 706.596.0111.